The impetus for my research was the forthcoming exhibition Hidden Gems: 20th Century Faces, at the Russell-Cotes Art Gallery & Museum (28 August 2009 – 30 April 2010. My time was spent primarily at the NPG’s Heinz Archive, where I was able to use the extensive library to research a number of our paintings including Self portrait with Rachel Hill by Walford Graham Robertson and The Artist in His Studio by John Minton. I was also able to find a number of paintings in other museum collections or sold at auction of the same sitter, e.g. Arthur Bradbury’s daughter Pamela, who appeared in many of his works. I also spent time researching at the archive of the Imperial War Museum. 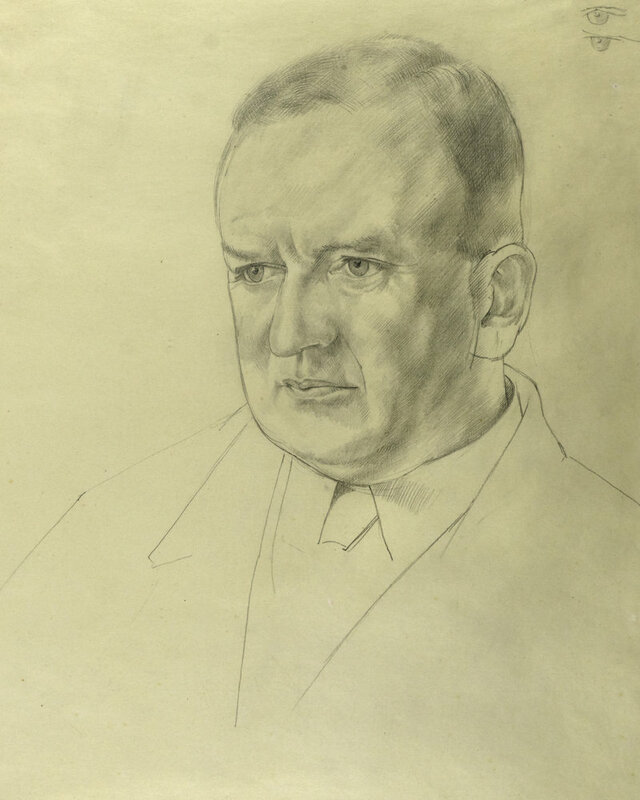 Here I was able to discover a wealth of background information into Stanley Spencer’s drawing Mr Morton – Works Manager which was completed during his War Art placement at the Clyde dockyards. My research outcomes will be used primarily in the interpretation themes and labels for our forthcoming exhibition. My time spent with Andrea Easey, the NPG’s Interpretation Editor, and particularly the Interpretation Toolkit on the Understanding British Portraits website (which I probably would have been unaware of had it not been for my placement) have really shaped the themes used to explore our paintings. We are also intending to include an activity area within the exhibition space based on the outcomes of my placement, and all my research has been updated within our database to be used for future enquiries etc. I thoroughly enjoyed my placement, particularly the CPD benefits I was able to gain. Prior to my research, I had never used an archive, and this placement not only gave me the confidence and skills to do so again, but also made me aware of these valuable resources, which I had previously been unaware of.